Our obstacle courses are always a hit! Great for school functions, church outings, graduations, and backyard fun. Make every party a blast! Race side-by-side through one of our obstacle courses! Great for parties, school events, church events, and corporate events. Add a 15x15 bounce house or small sports game for $140 use coupon code 15x15 at check out. 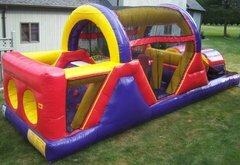 Add a combo bounce house or large sports game for $180 use coupon code combo at check out.